“Hidden History” means those bits of Liverpool that few tourists see, and in fact not everyone who was born and brought up in Liverpool might be aware of. 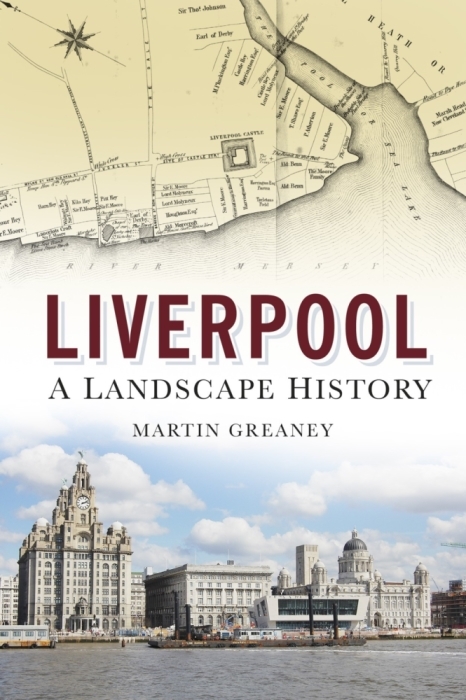 Nevertheless, they’re important parts of the city’s history, and may in fact reveal important facts and clues about Merseyside’s past. 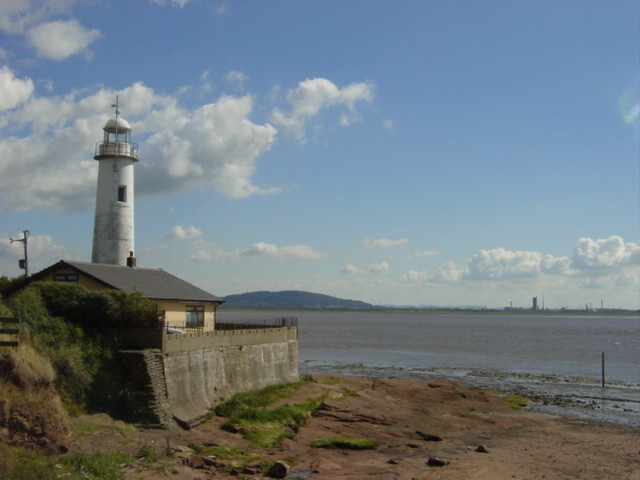 Hale township occupies a spot at the widest part of the River Mersey. Because of this the water slows down significantly. So much so that, at times in the past, a sandbank could once be seen to poke above the level of the water. This, the so-called Hale Ford, was an important crossing point of the river, and was used for hundreds of years. The crossing went from the end of Within Way due east towards Weston Point. We have records of one John, son of Peter Walley (or Wolley) of Runcorn who attempted the crossing in 1423. He was on horseback, and drove two more horses laden with fish from Formby. The two horses made it across the river, but John fell from his steed and was drowned. ‘Dower of the Sea’ was a term for one of the lord of the manor’s rights, whereby he could charge fines on anything which ran aground on his lands, or washed up. It’s interesting, and a little disturbing to read the emotionless description of the mere monetary value of the horse upon which John Walley died. During the Civil War Hale Ford was an important route from east to west. Prince Rupert crossed the Ford in 1643, with prisoners from his conquest of Bolton. Lord Molyneux fled across the Ford to Cheshire when ousted from his parish at Kirkham. The following year Rupert tried to cross again, but attacked government forced attacked him. Later in the same year he successfully crossed on his way from York to Chester. Outside of war time, horses were taken across the Ford in the hunting season. Rev. Thomas Blackburne used it when he left Hale to live in Wrexham. The ford was a dangerous route, however, never being completely dry. A ferry plied the same route, with part of the profits going to the lord of the manor. The two year absence of this ferry (for want of a boat!) led to losses of 20 shillings per annum that would otherwise have gone to the treasury. Opposite the Dungeon two miles of land in breadth might be enclosed before the present salt works, where the river is fordable at low water. Nothing came of this however, not least because previous attempts were washed away by the dangerous channel’s waters. Use of Hale Ford lessened as the 19th century progressed, partly due to the opening of the Widnes Transporter Bridge. The Ford was becoming increasingly dangerous anyway, and less reliable. Once constructed on the Cheshire side, the Manchester Ship Canal made it impossible to cross the Mersey on foot. Following the curve of Princes Parade, on the north west side of Princes Dock, are a set of rails which are one of the few clues left to the presence of Liverpool Riverside Station. Today the rails might look odd, as they are constructed like a tramway’s, with heavy stone setts bringing the level of the ground up around the top of the rails. The rails themselves, though you cannot necessarily see it, are heavier than normal tram rails, though they are the same shape, as they are built to carry much heavier leaods. The rails were especially built for the network around the docks, owned by the Mersey Docks and Harbour Board, and all the rails in the circuit are similar. These are all clues to the unique history of Liverpool Riverside Station, and the unusual measures taken to keep it competitive. Liverpool Riverside Station was a railway station owned by the administrators of the Liverpool dock estate, the Mersey Docks and Harbour Board (MDHB). It was opened on 12th June 1895, and provided a link for liner traffic (cargo, post, passengers) to get onto the intercity rail network without having to first navigate bustling Liverpool itself. The trains to Riverside came across the city using the Waterloo Tunnel from Edge Hill Station. Before the station existed, anything or anyone disembarking from a liner at Princes Dock would be far from any of the main Liverpool rail terminals – Lime Street, Central and Exchange, for example. Until the late 19th century they were forced to make their own way across town, but with increasing competition for liner traffic with Southampton, a decision was made to remedy the situation, and Riverside was built right next to the landing stage. In fact, passengers were protected from the elements right from the moment they left the ship, by a glazed roof over the roadway which ran between the station and the river, right up to the large, wide doorways flanked the station as it sat parallel to the waiting ships. Passengers were further treated to an immaculately-kept station with refreshments, booking facilities, and a waiting room all maintained to exacting standards within the two storey building. For more practical purposes, offices of the MDHB and customs facilities were also in that building. The station did so well to improve the link between liner arrivals and the national rail network that it was chosen to serve arrivals soldiers from the US and the Empire during both world Wars. Nearly 2.5 million passed through its doors. However, things were not perfect for Riverside Station. The route between Waterloo Goods Station and Riverside shared road space with other vehicles and foot traffic. Coupled with the tight curvature of the railway lines, this means that all of the MDHB lines were operated at walking pace. Between Waterloo and Riverside, a man walked in front of the rail vehicle with a red flag, ensuring the safety of other road users, while another man walked ahead of the train operating Annett’s keys to prepare the swing bridge and points. The steep ascent to back to Edge Hill just slowed journey times even more. This wasn’t made any easier by the small locomotives in use. The ground around the docks was not strong enough to deal with mainline locomotives (this was, after all, reclaimed land), so at first the only engines light enough to service the Waterloo-Riverside route were LNWR Coal Tank locomotives. These small engines moved trains from the river to Edge Hill station, where carriages could be transferred to larger engines for the onward journey. The small tank engines were more able to take the tight curves than the larger main line trains would have been, but the incline to Edge Hill challenged them, and sometimes both the Webb engines were needed to force a single heavy train up the hill. 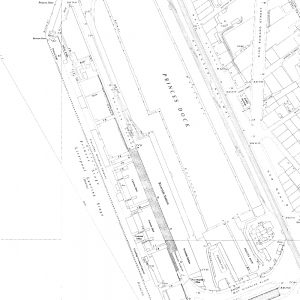 Plans were already in place by 1949 to strengthen the infrastructure of the area when a ship hit the landing stage and damaged the station. Once the works to repair the station and strengthen the land were complete, mainline locomotives could finally come all the way to Riverside Station. British Railways trains now ran on the MDHB lines. Riverside Station’s days were numbered, however. The rise of air travel in the 1960s led to a decline in Atlantic liner traffic. Shipping in general was declining by this point too. 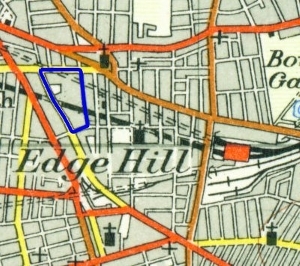 In addition, the main line to London was electrified in the 1960s, but this did not extend past Edge Hill, and Riverside Station floundered in a technological backwater. The last train to use the station was carrying soldiers bound for Belfast in 1971, and the station building was demolished in 1990. The trackbed was used as a car park for a decade (and some parts still are), until dockland redevelopments brought buildings to the site in the early 21st century. But some of the rails of the ‘Riverside Railway’ are still there today, and literally point the keen historian towards the site of one of Liverpool’s most important disappeared stations. Liverpool Riverside station, about 1914, is released under the Creative Commons Attribution-NonCommercial-ShareAlike (CC BY-NC-SA) licence, and is available at http://www.nrm.org.uk/ourcollection/photo?group=Euston&objid=1997-7409_LMS_3143. Parkside Drive – a West Derby bypass? Plans were once put together to make West Derby a more peaceful village. Only a few clues now remain to those plans. 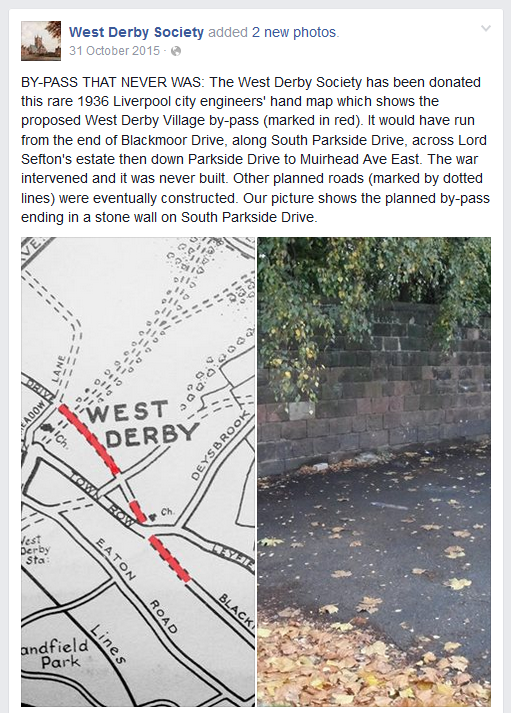 Martin’s Note: I’m indebted to the West Derby Society again for revealing this feature to me, in a post on their Facebook page back in December 2015. Having been a political centre for many centuries, the history of West Derby is as a cross-roads for many journeys, and has had the shops, pubs, churches and schools which attract people on a regular basis. West Derby Village was even once a tram terminus, and remains a busy thoroughfare to this day. And so it seems that, during Liverpool’s progressive and expansive decades – the 1920s and 1930s – the suggestion was made for a ‘by-pass’ (though not the type of multi-lane, multi-mile bypass we envisage these days!) to skirt around the village. It was hoped that this would make it a quieter, less congested place. 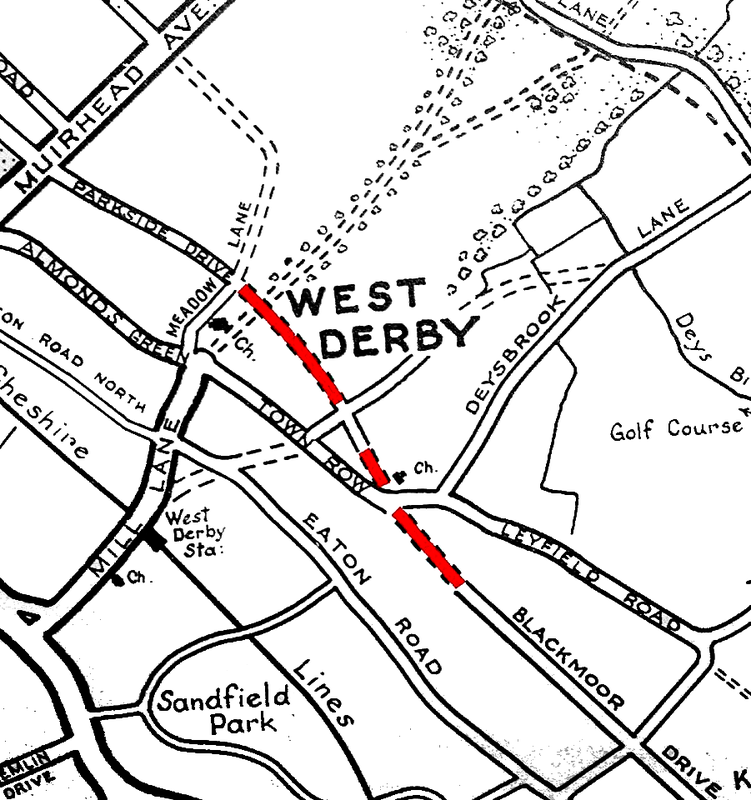 As the West Derby Society post shows, a map was drawn up by the city engineers in 1936, showing the proposed route. The road, marked on this map in red, would have taken Blackmoor Drive right through to Town Row (it currently stops short of Aysgarth Avenue). From there the road would have created a fork in front of St. Paul’s Church, with Town Row heading one way and the new road heading more directly north. The plan shows the road joining up with South Parkside Drive, and running all the way through to Melwood Drive. It then joins Parkside Drive again on the north side of Croxteth Park before hitting Muirhead Avenue. Apparently it was the Second World War which put the plans on hold, and they were never completed. Also, the Earl of Sefton was none too pleased about the prospect of having a road going through his park! The map showing the proposed route (in red) where the never-completed road would have run. What immediately strikes you as you look at the map is the name Parkside Drive. We still have South Parkside Drive and Parkside Drive, so it’s no doubt that the road in its entirety would have been known as Parkside Drive. One of the most satisfying elements of this is that not only does it explain the two disconnected stretches of Parksides, but it also shows that an actual park-side road would have been in existence, earning the name more truly than the current pair, perhaps! 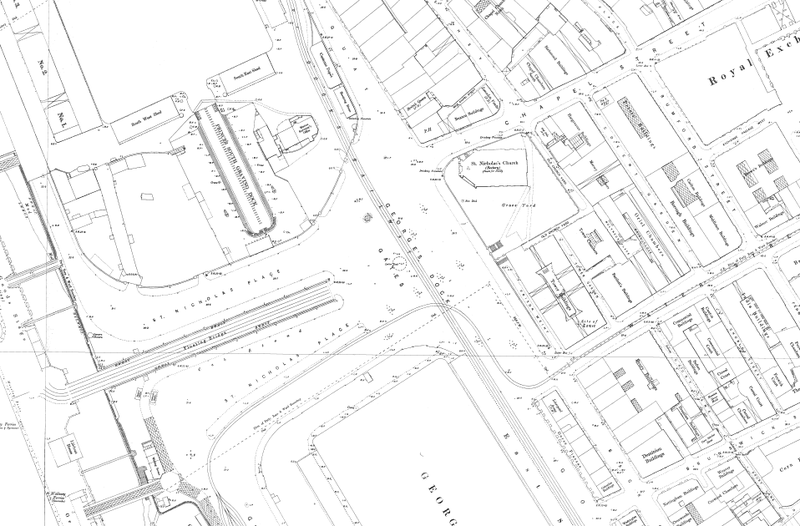 Looking at the near-contemporary Ordnance Survey map of 1937 raises a few interesting points too. Blackmoor Drive is in place by this date, stopping at the point that it does today. There is also a gap between the houses on Aysgarth Avenue which is wider at the spot where the by-pass would have been. Also, an area of Apsley Road is left without buildings. Were these merely accidents of development related to plot ownership, or where they deliberately kept undeveloped in case the road scheme went ahead? Looking further north, at South Parkside Drive itself, it’s certain that the roads and houses were built with the full Parkside Drive in mind. 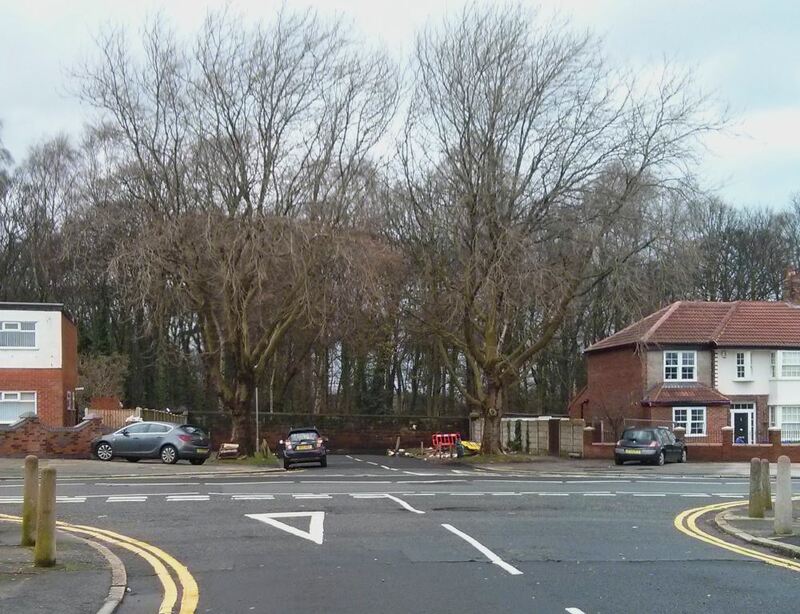 South Parkside Drive extends up to the boundary of Croxteth Park, even where this prevented the building of two or three more houses. It’s this short stretch, and the Croxteth Park boundary wall, which are shown in the photograph at the top of this page. So even today, with the bypass plans faded from living memory, there are still clues in the landscape – the street names and the oddly short ‘extra’ length of South Parkside Drive, which show what might have been. 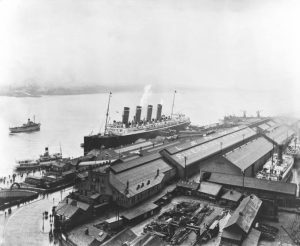 In the Victorian period Liverpool was Britain’s second greatest port. So there are hundreds of remnants of Liverpool’s trading golden age dotted around the landscape. We’re all familiar with the scores of warehouses, docks and the odd road bridge seen around town. But there are also tiny details which have survived and which give clues to the city’s history. This crane, known as a teagle, is one such detail. A teagle is a type of crane which was used to lower goods directly into the basement of warehouses. One such crane adorns the side of 11 Dale Street in Hackins Hey. 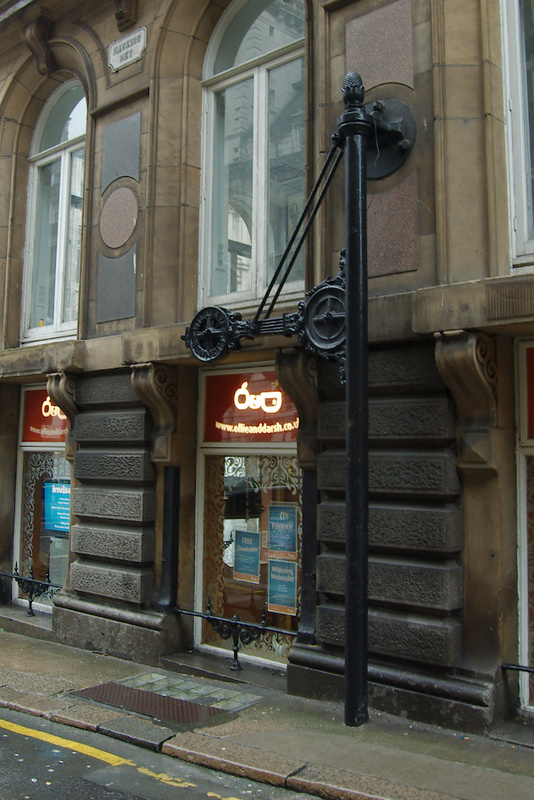 It’s in its original location, and presents several clues as to the nature of the building before it became a shared business space. This type of crane is known as a teagle. The teagle was invented in 1835 by the company Frost and Stutt. It was driven by belts (as opposed to the inefficient steam-driven lifts in use at the time). In the Dale Street case the machinery may have been in the basement of the building. This was under the crane, in the same place that merchandise was stored. There is an old (now semi-blocked) trapdoor leading into the basement, as you can see in the photo. It’s no coincidence that this is next to the crane. Goods would have been brought here from the ships it came in on. Next, workmen hoisted those goods down into the basement. It was stored here until it moved to its next destination, such as the markets of Liverpool and Lancashire. So this little arrangement of crane and trapdoor shows that the building’s basement was once used as a warehouse. Yet it may have been that the ground floor and first floor were offices. These offices may have belonged to the company which was storing the goods, but as often as not it made sense for an office owner to lease out the space to one (or more) other companies. Liverpool’s Victorian land values on Dale Street were, as now, extremely high. Renting out your basement to a company who could make use of it was an efficient use of real estate. It also helped a company pay the rates bills, or have a warehouse near the river without shelling out on an entire building. Sometimes an unlit cellar would do. The iron crane shows a beautiful attention to detail, with a moulded point in the shape of a pineapple at the top. Perhaps this makes reference to Liverpool’s many exotic trade destinations, or the warehouse contents. Foliage-like designs on the two wheels complete the crane. It’s sturdily attached to the building itself by a heavy circle of metal and stout bolts. Despite this the crane arm itself is rather light and elegant. 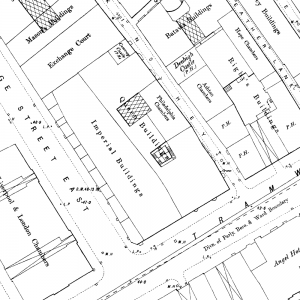 We can see on the 1891 map of the area that the premises were known as Queen Buildings. The detailed 1:500 map marks the crane itself, as well as the trapdoor into the basement. It also shows the inebriating number of public houses (P.H.) in the area, but we won’t dwell on that right now! And no doubt there are plenty of other cranes pock-marked about the city centre, from Kirkdale to Toxteth. After all, warehouses were spread right across that area. Let me know if you spot any more! 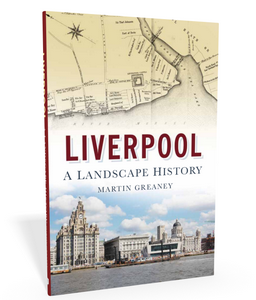 Image: The image of the crane is my own, and can be seen in my book, Liverpool: a landscape history, available signed from this site and (unsigned) from all good bookshops. Knotty Ash Village, and Springfield Park, are part of a historic area. They’re on the edge of West Derby and also on the main route between Liverpool and Prescot, and then on to Manchester. The old mail coaches would have flown past in their day, and the tram routes have left their mark in turn. Springfield Park was once the grounds of Springfield House, one of many expensive and out-of-town Victorian properties in the area. The park’s obelisk, a monument to Nelson, was intended as a gift to Liverpool from one of its residents. The man, a sugar merchant called Mr Downward, had his gift rejected (dismissed as a ‘half Nelson’ by some wag on the council). So he decided to put it up in his own back garden, this being the grounds of Springfield Park. In 1907 the park was bought by the city council for £14,000, and it’s been a public space ever since. 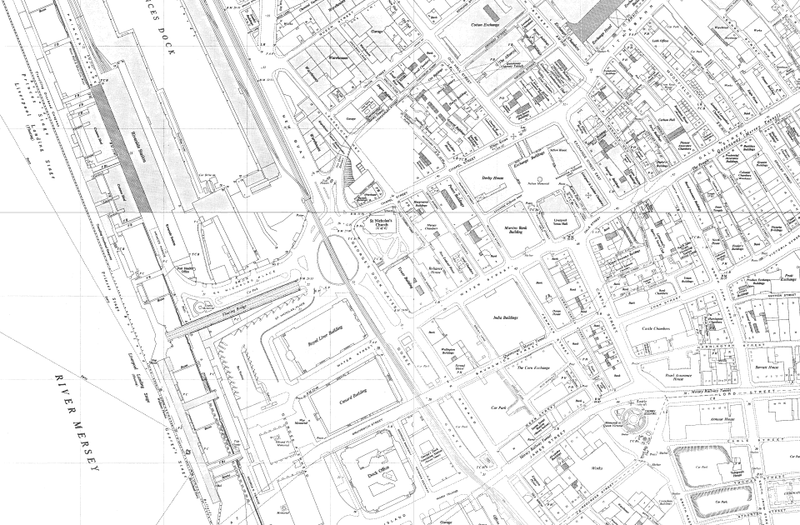 We can overlay the 1888 – 1913 Ordnance Survey with the modern satellite image (see above). 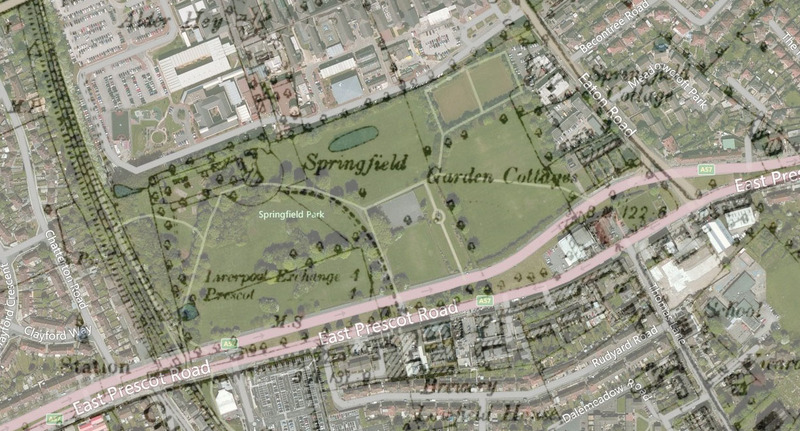 This shows how the boundaries of Springfield House’s grounds match up well with Springfield Park. The Nelson Memorial is still in it’s original position, though its mark on the map is feint. The northern lane of East Prescot Road is the newer one, cutting through the Park. The long driveway to the park almost matches the modern pathway, arcing all the way to the road. 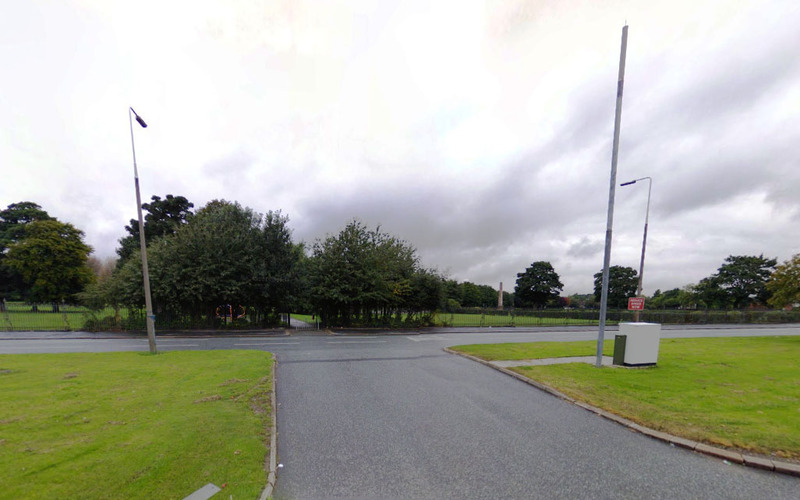 From there it crosses the northern carriageway to the southern (the original course of the Prescot road). The image above shows the Google StreetView of this location for September 2008 (before the construction crew moved in). The Park entrance clearly inherited its placing from the original Springfield House entrance. The gap in the central reservation is a direct descendent of the House’s drive! And by the looks of things, the new hospital will have an entrance on this site too. What a satisfying conclusion to this phase of the place’s landscape history! 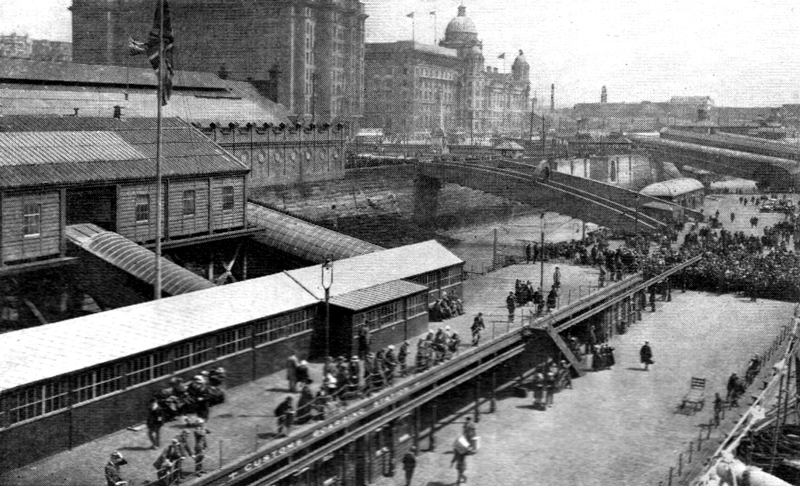 The dock railway was built in Liverpool to solve a challenge which other cities did not face. With dock expansion, ships were docking further and further from the central business district. Places like Manchester and Bristol stood astride their rivers, and twice the mileage of docks fit in each mile of river than in Liverpool. Therefore, much more than other places, railway transport became important to transporting goods. This could be from the outlying docks into town. Some went further, carrying on their journeys further into Britain, or onto new ships going elsewhere. The remains of the dock railway are still embedded in parts of the docklands, even though the roads are now dedicated to other vehicles. It’s interesting to note that at one time the roads would have been shared between the locomotives on the one hand, and vehicles like trucks and horse-drawn carts on the other. Even in the early 1960s steam engines could still be seen following a man with a flag near the Pier Head. But by then the increasing pressure from the motorcar was becoming too much. The main roads along the docklands – e.g. the Strand – were in need of modernisation to deal with the increased traffic. Today, you can see the rails outside the Maritime Museum entrance, bounded by two sets of buffers. The rails run into a large iron-banded door to the north east side. All sorts of stories are associated with the Sanctuary Stone. Its name conjures up anything from slave-related scenes to cheeky apple snatching medieval urchins. You might never see the same story told twice. 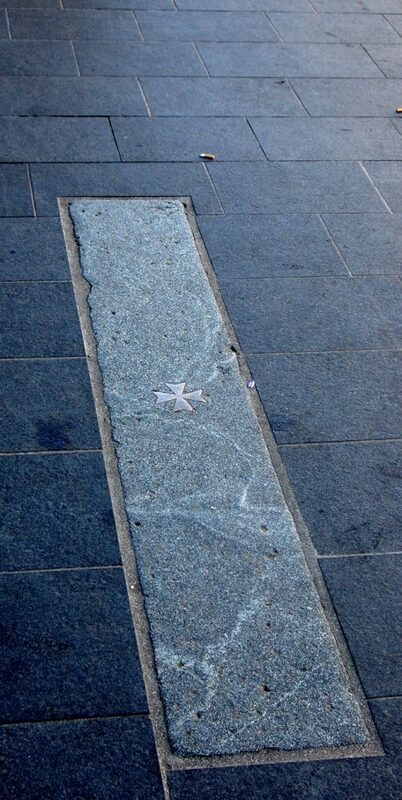 The Sanctuary Stone sits on Castle Street in the centre of Liverpool. Of greater certainty is that it marked one of the boundaries of the medieval markets which took place in the town for centuries. Three other similar stones would possibly have been seen on High Street, Dale Street and Water Street. All would have been a couple of feet tall originally. 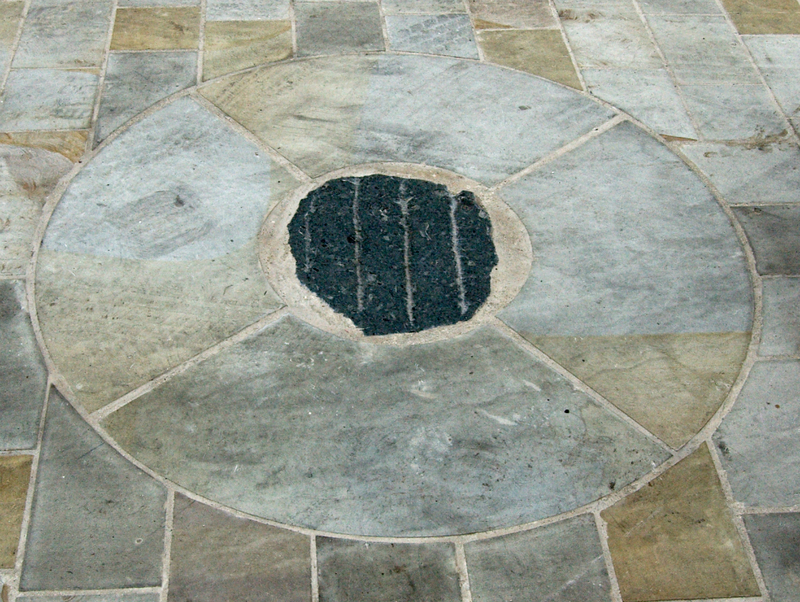 The remaining one is made of a coarse volcanic rock, in stark contrast to the native local sandstone. It probably arrived on the banks of the Mersey through the action of glaciers travelling down from the Lake District. The word ‘sanctuary’ is often taken to mean that the law did not run within the bounds of the market. Some tales have the aforementioned street urchins being immune from arrest if they reached the Sanctuary Stone before the local copper laid a hand on them. This makes less sense if we think about the Stones as pillars. That’s not to mention the strangeness of this arbitrary method of law enforcement! Still, it’s thought that the rule of law was slightly different during market and fair times. Policing was carried out by officers of the Crown. Justice meted out on the spot, rather than involving court summonses and time-consuming arrests. 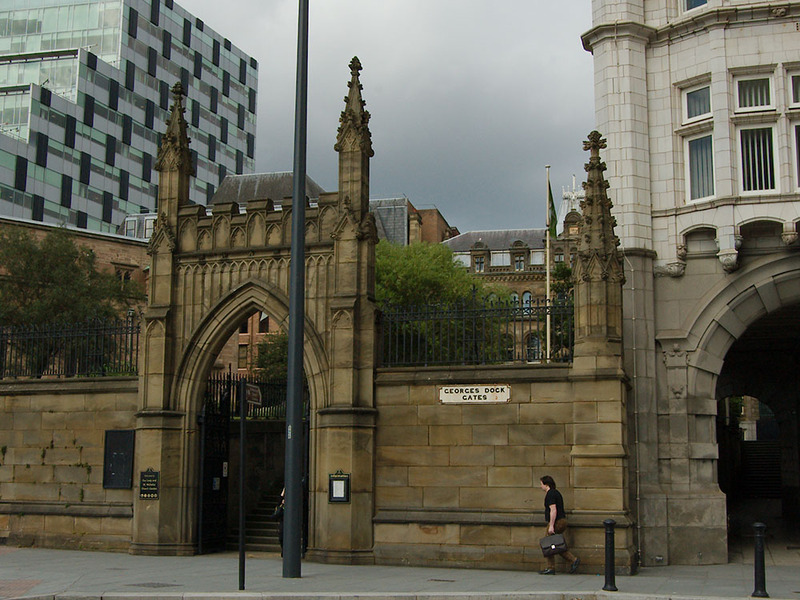 Whether or not other Stones still remain under the road surfaces nearby, the Castle Street Sanctuary Stone is the only one known to still exist. It has been dug up several times in the last 100 years, most recently to accommodate roadworks in 2011. When it was replaced, a newly-minted pound coin was laid alongside it. This adds to two similar coins laid during previous excavations in 1937 and 1947. Liverpool, as a city, is master of reinventing itself. It re-uses parts of its landscape when priorities (and economics) change. The Pier Head area in general has seen many, many changes. The filling of the Pool, and the creation of the first wet dock, is perhaps the most significant. The road sign declaring George’s Dock Gates is another clue to these changes. 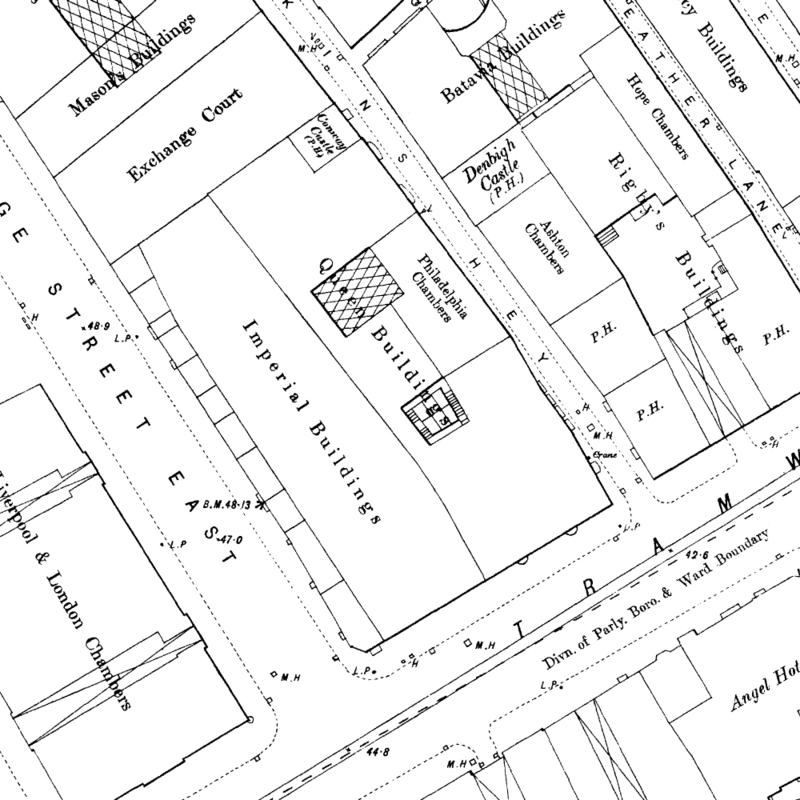 Old Ordnance Survey maps (like the 1893 edition below) show a large open square area just to the river side of St Nicholas’s Church. 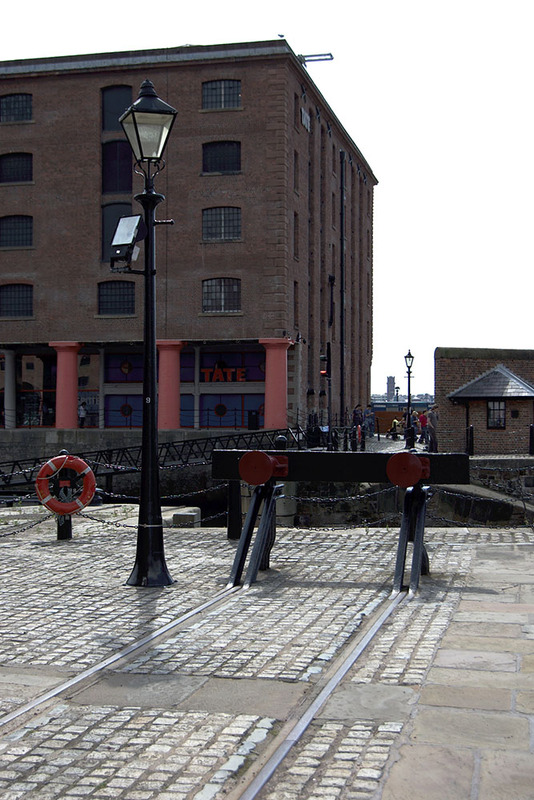 This is labelled as George’s Dock Gates. It lay over the filled in form of George’s Dock Basin (which led into both George’s Dock and Prince’s Dock). The street sign is not attached to an old section of the wall of George’s Dock Basin, contrary to what some other websites will tell you. Rather, it refers to this area, which acted as a sort of entry way into the central dock system. George’s Dock still held water when the walls of the churchyard were erected. The George’s Dock Gates name was already in use. 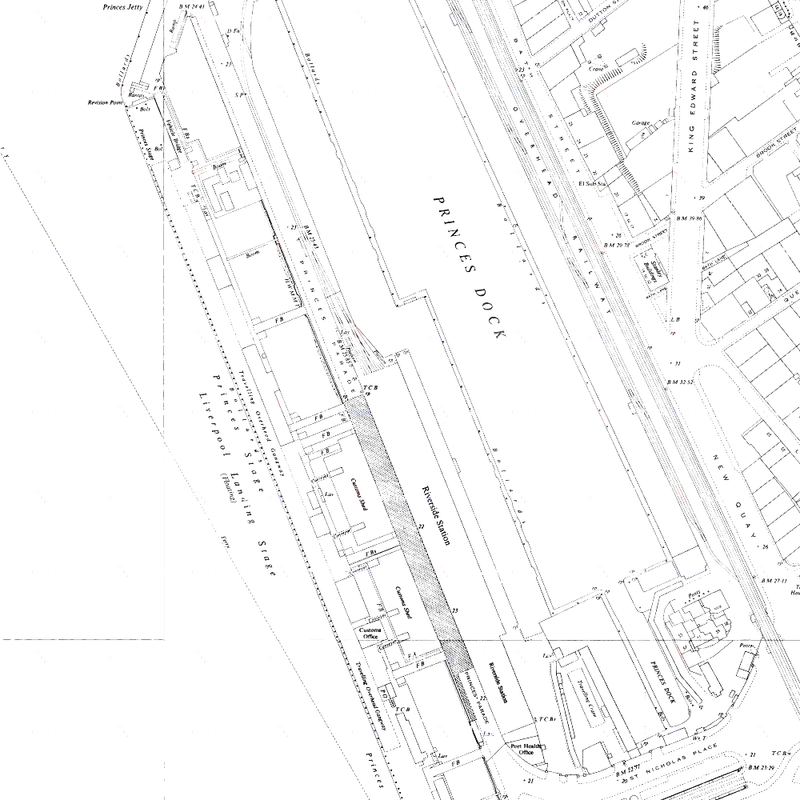 The name is marked on maps right through until the Three Graces replaced the dock basins behind the Pier Head. This map from the middle of the 20th Century still displays the name. For the city today, it’s a reminder that the busy dual carriageway area of the waterfront was once central to Liverpool’s central activity: trade and exchange.